If you live anywhere in the eastern U.S., you had a moment this winter when you just wished it was summer. Maybe it was during the polar vortex cold snap in January. Maybe it was after the bomb cyclone or during any of the endless nor’easters. Or perhaps it was when your baseball team’s games got snowed out in April. Well, congratulations. Your wish, uttered in those dark, cold days, came true. Rather than a nice prolonged spring—which is objectively the best season—the U.S. has jumped right into summer. From coast-to-coast, May has been extremely hot. 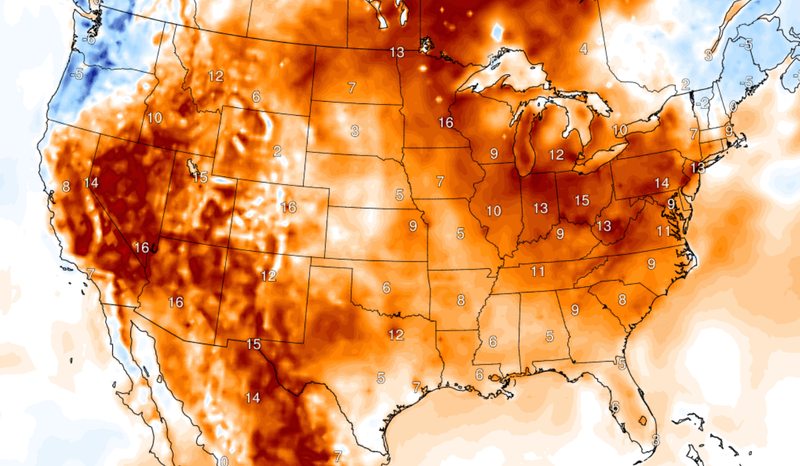 With what National Weather Service program manager Victor Murphy dubbed “blast furnace temps” across the Lower 48, it’ll likely go down as the hottest May on record for the country. The past week has seen widespread heat records fall across the normally mild Midwest. Chicago topped out at 97 degrees Fahrenheit over Memorial Day weekend, good for its second-hottest May day on record. Minneapolis recorded its earliest 100 degree Fahrenheit temperature as well as its longest May stretch of 90+ degree Fahrenheit days. The remarkable heat comes just six weeks after the city saw nearly 15 inches of snow fall. It’s also miserably hot in locales more known for heat like the Southwest, where Phoenix is forecast to reach 103 degrees Fahrenheit on Wednesday. All told, the U.S. has seen 3,070 daily and 118 monthly high temperature records set for the month-to-date. In comparison, there have only been 119 daily low and six monthly lows, according to the National Centers for Environmental Information. Preliminary data show that the average U.S. temperature for the month through May 28 was 64.6 degrees Fahrenheit, just 0.11 degrees Fahrenheit behind the hottest May on record: May 1934, which fell smack dab in the middle of the Dust Bowl. For the last two days in May, temperatures from Las Vegas to Columbus could see temperatures up to 15 degrees Fahrenheit above normal, which may be enough to drag this May to a new record. A big atmospheric pattern flip has brought about this unseasonably fast shift to summer. A record or near-record disruption of the polar vortex, a weather-driving phenomenon that lives in the layer above our atmosphere and generally keeps cold air trapped over the Arctic, occurred in February. Because the disruption was so severe, it kept rippling through the atmosphere for months on end. It was pegged as the culprit behind haywire winter weather as cold air spilled out of the Arctic and into the U.S. and Europe. This set-up continued to keep the U.S. chilly into April. In May, a big pattern shift occurred as the jet stream that normally keeps the polar vortex and its cold air trapped in the Arctic moved pretty far north. That shift has allowed warmer air more associated with the tropics to make its way to U.S. and usher in summer with a vengeance. Even with the calendar set to turn to June in a few days, the heat isn’t going to stop. The mercury is forecast to crack 110 degrees Fahrenheit in Phoenix for the first time this year on Sunday, starting “but it’s a dry heat” season. And hey, it could be worse. Did New York Just Get Hit By a Derecho?